This whole fox fur overcoat is fashionably design and gracefully loose, the generous thick full fox fur gives you ultimate style features sleeves providing enough room for a flawless fit, this fox fur outerwear features a variety of stylish styles attached flattering and convenient slant pocket with stand collar design provides perfect detail single hook closure at top neck for added warmth, spectacularly soft fur fully lined for comfort when wearing it. Due to its outstanding and excellent material, Genuine fox Fur is amazingly resist to severe cold weather that keep you warm in winter. High-tech soft surface finish and elegant designed fit your vogue taste and feel comfortable on your body. Roomy wrap outerwerr with soft fur trim, stylish can fit thick sweaters underneath it, Perfect for wear to work, wedding and outdoor dinner. Morden Style, quality assurance. We guarantee that all Genuine Fur outerwear does not contain harmful material or irritative elements. Keep it away from wet, fire and lighting cigarette. WHAT ARE YOU WAITING FOR? 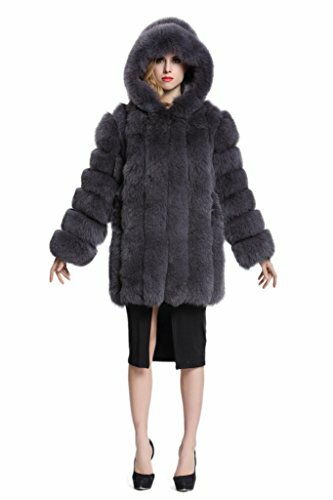 CLICK THE ""Add to Cart"" BUTTON RIGHT NOW TO GET YOUR FULL FUR COAT! Elegant stand collar with handsome slant pockets design look stereoscopic and gorgeous as the cool model when wearing this warm and fashion fur coat, These outerwear are suitable for any kindly costume that perfect for any anniversary, engagement, party, dating, wedding, daily wear, etc. Friendly Note: All of our fur outerwerr productions are made from Non-Wildlife, Please carefully read the size chart on display piuture or just feel free contact us with your size information after purchase. we offer various of stylish and gorgeous fur jackets/coats, fur overcoats, fur hats, fur headbands, fur scarfs/cape, etc.